International postage NOT available on this box. 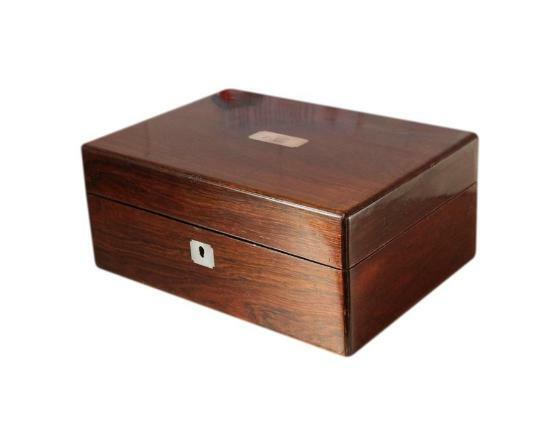 This is a beautiful large antique jewellery box with a lovely Mahogany veneer. It has multiple storage compartments and Mother of Pearl inlay. It dates back to the Victorian period, circa 1890/1900. 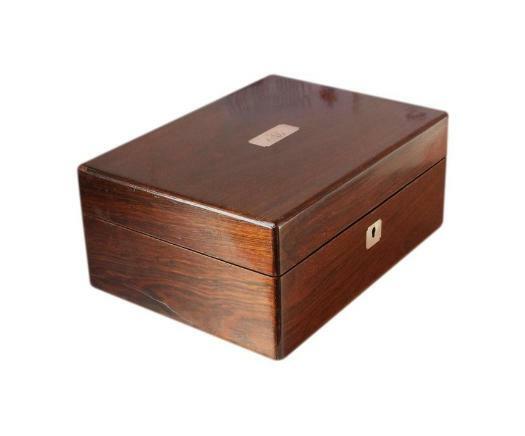 The beautiful Mahogany veneer on this box has lovely figuration and a glossy polished finish. There is an inlaid Mother of Pearl cartouche on the lid and an inlaid Mother of Pearl escutcheon to the keyhole. There are beautiful engraved fancy script initials on the cartouche which appear to be 'AS'. 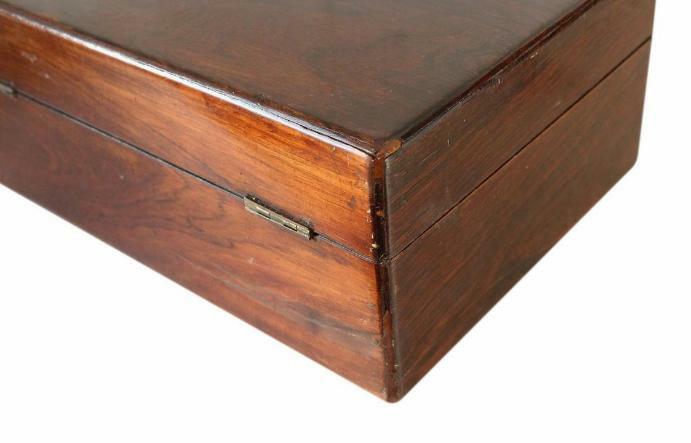 The box is complete with its original brass 'stop' hinges which hold the lid upright at a 90 degree angle. It also has its original brass lock. Please note there is no key. The bottom of the box has its original hessian covering. 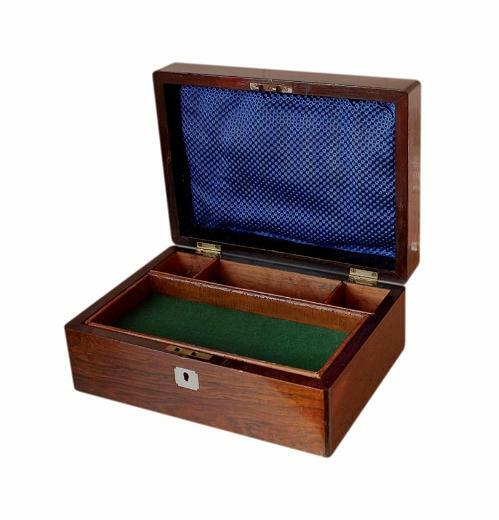 The interior of this box is in original condition, apart from a felt lining that has been added by a previous owner. The top of the interior has its original removable storage tray at the front. This is large and shallow and has the felt lining mentioned above. To the rear is three further smaller but deeper compartments. Beneath the removable tray is a further large roomy compartment. This and the rear compartments have their original tan coloured leather linings. The walls of all compartments are unlined. 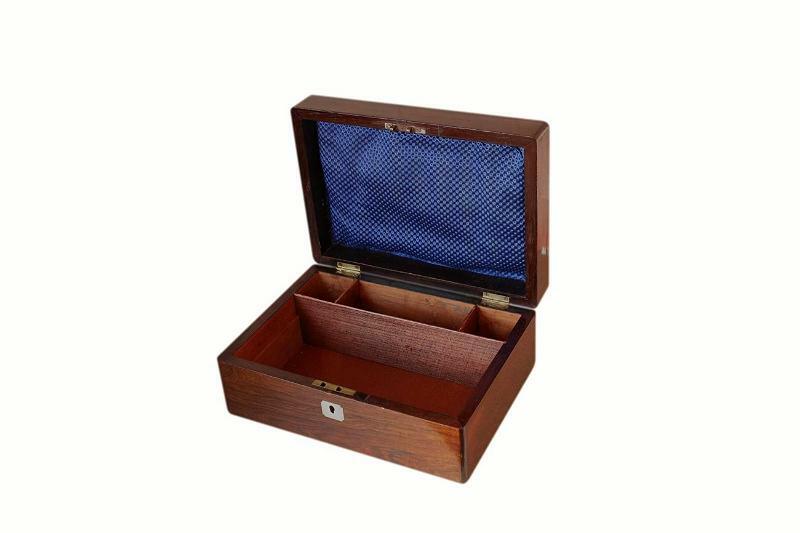 The inside of the lid has its original dark blue textured silk panel. This is still secure but has got a little 'baggy' with age. 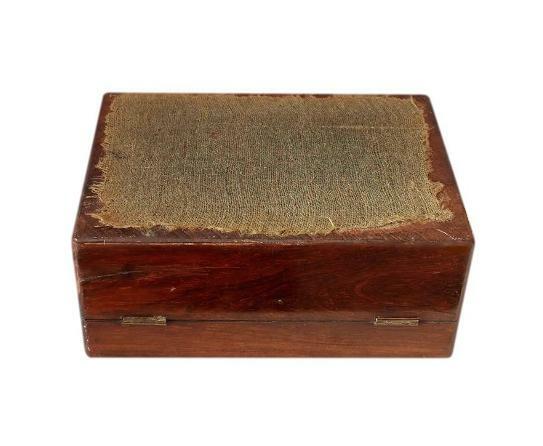 This lovely antique box is in very good condition for its 100 plus years of age. The Mahogany veneer is still beautiful overall. 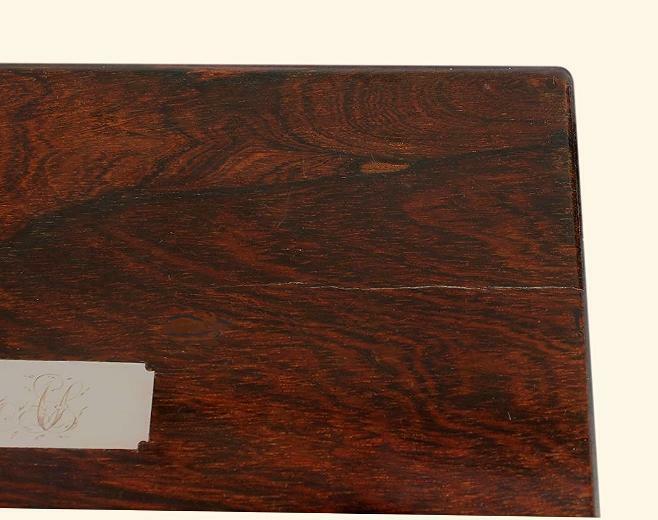 There is a fine age related hairline split on the lid and some loss of veneer to the back left corner of the box. These flaws, in our opinion, do not spoil the lovely overall appearance of the box. Please see the close up photos of these areas and decide for yourself before purchasing. Other than these flaws there is minor age related fine scratches and wear as we'd expect on a box of this age. The covering on the bottom of the box has age related friction wear. There is no key with this box and we do not know if the lock is functional. The interior wood being unlined and in its natural state, may not be suitable to all tastes. Please bear this in mind before purchasing the box. 24.8 by 12.2cm with a 4.1cm depth. 24.5 by 11.0cm with a 2.6cm depth. 14.7 by 5.2cm with a 7.0cm depth. 5.2cm square with a 7.0cm depth. We are very sorry, but due to the size and weight of this box, we are unable to offer postage outside of the UK.